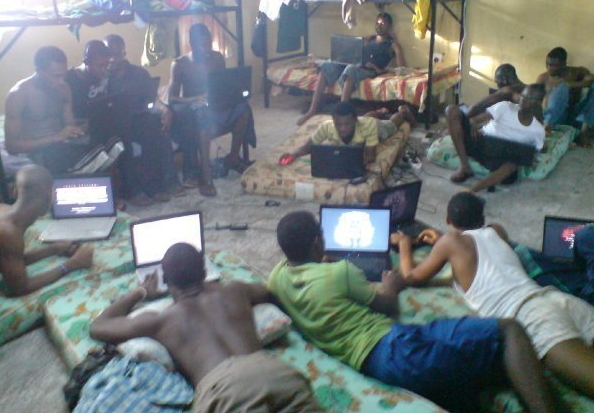 At least 100 undergraduates of tertiary institutions across the Southwest have been detained for various cybercrimes by the Ibadan Zonal office of the Economic and Financial Crimes Commission (EFCC), it was learnt yesterday. Addressing reporters in Ibadan, the Oyo State capital yesterday, the commission’s Deputy Zonal Head, Ibadan, Kazeem Oseni, who spoke on behalf of the Acting Chairman Ibrahim Magu, said the suspects were arrested for mainly online love scam, Automated Teller Machine (ATM) fraud and online marketing scams. Oseni added that the Ibadan office had recovered around N277.9 million from fraudsters in the past nine months, adding that 50 cases had been instituted against the suspects with 381 others being investigated. ”The commission is attending to 431 cases among which 50 cases are already in court. In the past nine months, we have arrested 195 individuals in connection with bank fraud, internet fraud, land and general disputes. Among the cases in court are the ones involving the Vice Chancellor of the Obafemi Awolowo University, Ile-Ife, that of the Federal University of Technology, Akure and Federal University of Agriculture, Abeokuta. Let EFCC be ready to arrest more as ASUU is on strike again. In as much as what they are doing is bad,government is not helping matter at all, those money they are sharing,if channeled to education sector,this kind of crime and others will reduce to a minimum. Whilst most countries are advancing in the field of technology and intellectual property, Nigerian youths are advancing in cyber fraud, theft and various forms of crime. This is a real shame, disgrace and embarrassment. They are following the footsteps of their leaders in government, who have stolen money that should be invested in good education, infrastructure and technology. My heart bleeds for Nigeria, especially our youths as the future seems bleaker than ever. Lord have mercy. Good to know that the police force is on top of the game. I was defrauded by one Adeniji Omolola of best_naija_online_shopping through a Diamond Bank Account No.9989177229 ( A yellow account) I ordered some items and into the Diamond account since 10July, 2017, up till now I am yet to take delivery as he refused picking calls and responding to online chats.